I had heard mixed reviews about Madam Sixty Ate but the whimsical decor and beautifully plated food made me really excited to check out this restaurant. Located in J Senses, the restaurant opened a few months ago with chef director Chris Woodyard and head chef Andrew Braham at the helm. There's a tasting menu which goes for $680pp but this time we decided to order à la carte. We started off with homemade bread which came fresh out the oven with a deliciously crispy crust and soft soft innards. I loved how the garlic butter (?) came wrapped. The scallops were so-so. Quite small, rather boring, and I wasn't a fan of the anchovy puree they used. The saving grace was the amazing pork rillette, served on a lightly toasted brioche bun. I'm not a fan of pâté so I've never tried rillettes but from now on I'll definitely give them a go. The pork had a really rich texture and was buttery-smooth. Yum! This dish came highly recommended in Time Out's review (I've obviously done a lot of research on this restaurant) and while I agree that the dish was beautifully presented and each bite had a whole new flavour, I disagree that this could ever be called a paella. It was basically just mussels, squid, scampi, rabbit and some puffed rice served in an interesting manner. How one could ever associate it with paella is beyond me. While I do enjoy deconstructed food for its beautiful presentation and creativity, I find that the most exciting part about eating something deconstructed is that while it looks completely different to the dish you ordered, when each of the components are eaten together the flavour is all there. You should be able to close your eyes and think you're eating a paella and then open them and be completely shocked by what's in front of you. Unfortunately, I didn't associate anything about Madam Sixty Ate's "paella" with the real thing. Again this got rave reviews. I liked the fun presentation and the quirky name, but it wasn't as wow as I expected. I expected the pork belly to be more flavourful with a larger amount of fat (maybe I'm just being greedy) but I felt the texture just wasn't quite there - not tender enough. This was really good - a huge portion of seared bonito fish, served alongside mussels and chorizo. The fish was perfect, skin lightly crisped, flesh soft and flaky, and the tomato consomme worked beautifully with it. I also really enjoyed the crispy ... thing... on top! Didn't try this dish but it seemed like the consensus was "meh". Again I was slightly disappointed by their take on the classic French pastry. It didn't taste like mille feuille at all, especially as they used rice pudding mousse instead of pastry cream and candied apples instead of, well, pastry. The milk sorbet with the vanilla mousse were good though! This was sweet overdose but I actually kinda enjoyed it, though the honeycombs were too much for my cavity-ridden teeth. I loved the popcorn and the honey parfait components, and the chocolate mousse was rich and decadent. Perfect in small portions! $70 for coffee and donuts sounds a bit extravagant but this one was perhaps my favourite. 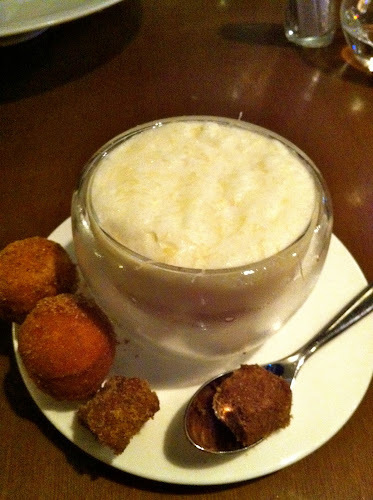 The "coffee portion" was comprised of gianduja mousse and kahlua cream, and topped with cardamon froth. It was simply delicious - not too sweet with just a hint of alochol. The spoon held an "espresso sugar" and the two wee donuts were cinnamon ones! Nomnom. All in all there were some hits and misses, but I did enjoy the evening. The food was plated beautifully, the restaurant was quirky and totally my style (though again crappy acoustics make for very tiring dinner conversation), and the service was pretty attentive. It was fun and exciting for the most part, and I'd be happy to return!